So what am I actually doing in Bhutan you might ask (apart from going on hikes, attending festivals, eating and then blogging about it!)? Well, in the last few weeks I’ve started volunteering with a few different government and non-government organisations in Thimphu and I’m really enjoying it. RENEW (Respect, Educate, Nurture, Empower Women) is an NGO that offers counselling and support to women who are victims of domestic violence. My role initially is to help them secure some funding from the Japanese to build the second stage of their women’s shelter, located 20km out of Thimphu. If the Japanese then decide to grant the funds, there may be an ongoing role for me in assisting with the construction management. The Royal Academy Project is an initiative of the King of Bhutan. He has seconded engineers, architects and educators from various government departments to form a team to plan and implement the construction of what will be a state of the art boarding school for academically gifted students from all over Bhutan. The curriculum will be similar to the International Bacalaureat and students will receive full scholarships. The project site is quite amazing, perched on a hill overlooking Paro. The construction drawings, being prepared by an Indian Architecture firm, are almost complete and meanwhile the Dept. of Roads are cutting in the access road to the site and the army have started tree clearing. My role initially has been to run a tutorial/workshop on the scheduling software “MS Project”. One of the interesting things about scheduling projects in Bhutan is that first it is necessary to consult with the Buddhist astrologers for the most auspicious date to have the Salang (ground breaking) ceremony. The astrologer has put forward three dates for the King’s consideration, as he will of course be the guest of honour at this ceremony! The Gross National Happiness (GNH) Centre is now an autonomous NGO but was established initially by the government to educate and promote the GNH philosophy to Bhutan and the rest of the world. They are planning to build a conference and meditation centre in Bumthang (central Bhutan), where they can accommodate people from all over the world to run courses on GNH. I’ve been asked to review the design drawings and provide feedback. The Ministry of Works and Human Settlements (MoWHS) are like the Australian equivalent of the Dept. of Planning, RTA and Public Works all rolled into one. Their Rural Planning and Development Division identified that they could benefit from my assistance with the master planning of a couple of villages in central Bhutan (near Trongsa). The survey plans are currently being prepared and once they’re completed, I’ll be visiting the villages, speaking with the locals and helping to develop a concept masterplan. In the meantime I’ve been reading up on the Bhutan building rules, Urban & Rural Planning Guidelines and Traditional Architecture Guidelines. I’m really grateful to our AVID In-Country Manager for facilitating the contact with these organisations. Volunteering independently suits me really well at the moment. If I was to get paid work, I would automatically loose the benefits I receive as a ‘dependent’ under the AVID program e.g. medical insurance and a flight home and I would also most likely need to change my current visa, which may involve leaving the country and coming back again. Volunteering allows me the flexibility to choose the hours I work to fit in around my University Masters requirements. And it also allows me to be involved with exciting projects where there is a real need, often limited funding and where I can see I might be able to add value. This Post was tagged Australian Volunteers for International Development, AVID, consulting in Bhutan, volunteer, volunteering in Bhutan. Bookmark the permalink. All sounds amazing Jen! Bhutan is lucky to have you!! What a great way to use your skill set. I’m amazed you have any free time at all! This looks like an interesting and varied group of projects for you to be involved in, and could provide opportunities to get around the country and meet the people. Great news. Hope it all goes well! Projects sound amazing Jen. As does the blog so far. 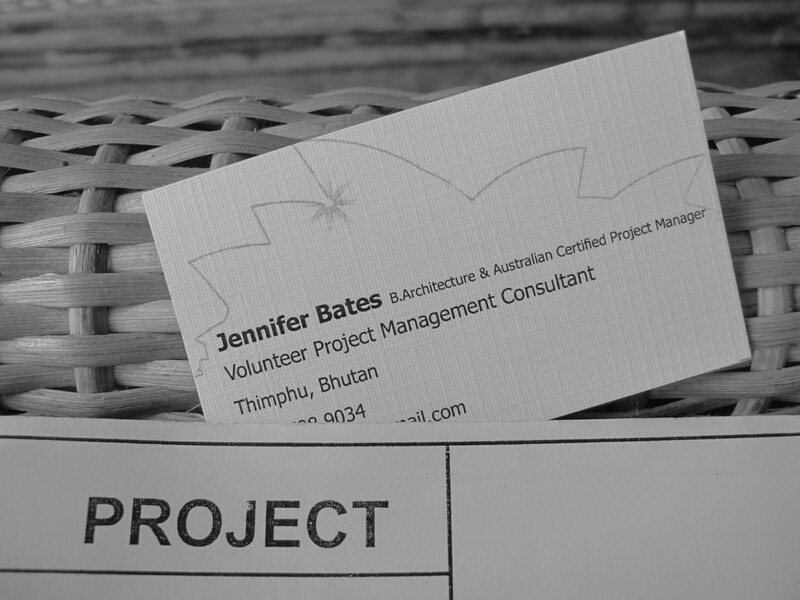 Volunteer Architect and Project Manager at your leisure and travel writer and raconteur to boot. A tad jealous back here.